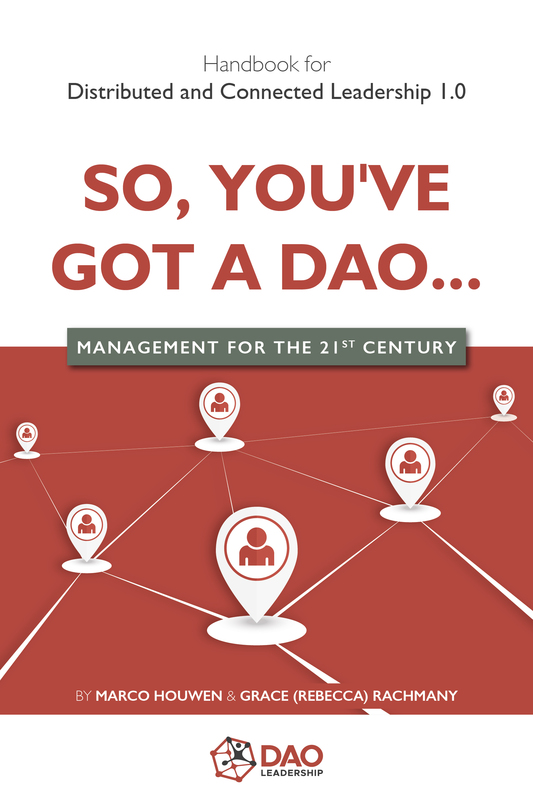 By @SimonCocking, review of SO, YOU’VE GOT A DAO …: MANAGEMENT FOR THE 21ST CENTURY by Grace Rachmany and Marco Houwen. Available from Amazon here. This handbook provides the elements of leadership that are needed for a distributed form of governance for foundations, companies, and perhaps, one day, governments. The promise of blockchain and distributed ledger technology is a world where people take back the control over their own money, identity and data. As an expression of this promise, organizations in the blockchain space are aiming to create Distributed Autonomous Organizations (DAO), foundations and even decentralized and distributed companies. We can already see the solutions are somewhat clunky. Hard forking of a crypocurrency protocol is hardly a replacement for democracy. Having everyone in an organization responsible for whatever they want isn’t much of a solution either. The result is a high level of inefficiency, whether that expresses itself as multiple bitcoin currencies or companies that are unable to respond to customer emails efficiently. We are living in interesting and fast moving times. It is quite possible many of us are already moving in DAO ways of working without having even realised that it has happened. This is certainly the case for those of us who have become gig economy workers, working in a more freelance way, with a variety of clients and people we have working relationships with. This book also offers a useful potential roadmap for those who have not yet moved to remote working but can see that there are actually less and less reasons for needing to commute to a physical location, in an office, in town, to work for someone. In many ways the slowest to accept this idea are the large multinationals themselves, as we have seen with some moves to row back against remote working. The thinking being that ‘we will provide you with gilded cages, all the food and drink you want, and hey free pool tables, but you still need to actually come and be HERE in our corporate offices…’ However the talent itself is starting to realise that there is more to life than spending all of your time in those gilded cages. In this context this book makes a refreshing change to many of the management books we have had to review recently that focus on how can the manager / leader keep their staff happy and motivated, while still basically operating in the traditional working paradigm. Instead by beginning from the starting point that DAOs are the future way in which many of us will want, prefer and demand to work, the authors then attempt to get their teeth into what that might look like, and how it might be achieved. We are still at the bleeding edge of this change in working practices, and many will fight against it for a long time, however for more and more people if not institutions, this is a far more appealing way to live, work and operate. This book therefore is starting to ask all the right questions and attempt to discuss and present possible solutions to how to do it well, and what good might look like. It is phrased as the 1.0 version, and subsequent editions would certainly benefit from some more case studies and explorations of where it has actually already been implemented, and the successes and challenges they experienced in doing so. Apart from that it is a smart, thought provoking book that is well worth reading.